The best time for a criminal defense attorney to become involved is before you actually are charged with a Columbus criminal offense. If you feel that you are under investigation, contact our experienced criminal defense attorneys we will do our best to possibly prevent charges being brought against you. Things that happen at the beginning of the investigation or immediately after an arrest can have a major effect on the outcome of the criminal case in Columbus. Our criminal defense lawyers encourage our clients to be fully engaged in their cases. We have the experience and knowledge of criminal defense laws to help you obtain the best result in your case. The criminal justice system is complex and intimidating. Knowing and exercising your constitutional rights is critical at every stage of your criminal defense case. We have acquired the knowledge and experience to guide you through the case so that your rights are fully protected and your case fairly resolved. 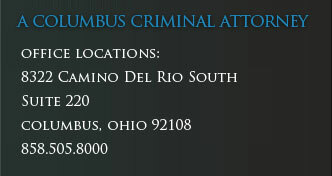 Contact our Columbus criminal defense attorneys to discuss your case and possible options. We are dedicated and willing to work to protect your rights before they are taken away by the police. Don’t leave the outcome of your case in the hands of an inexperienced defense attorney. Give us a call we are here to help all those in Columbus, Ohio.